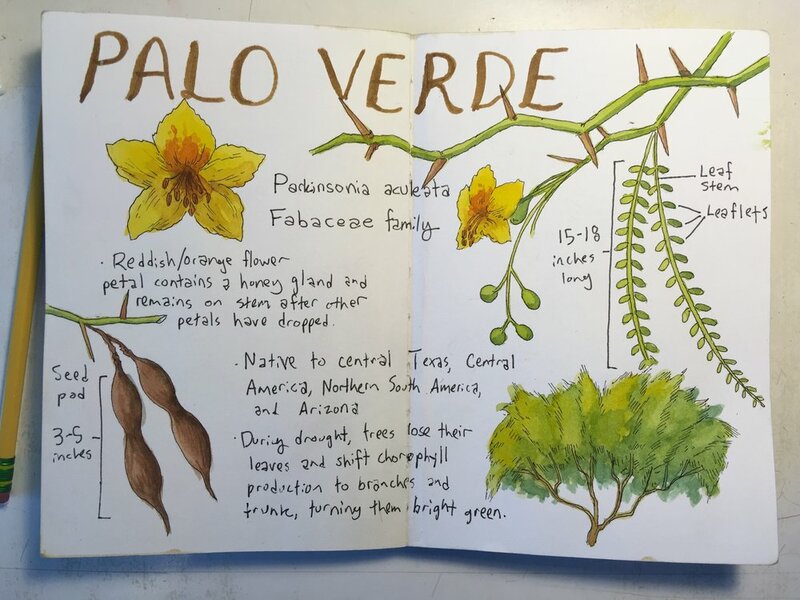 I am proud to have the opportunity to teach my process of observation, research, and creativity at a Nature Sketching workshop at the Botanical Research Institute of Texas (or BRIT) this coming March. We'll work on a few loose drawing exercises to warm up, then stroll over to the Fort Worth Botanic Gardens to do some observation. When we're done sketching, we'll utilize the BRIT's extensive library on the second floor to do some research about our favorite plant, then finish our pieces with color, information, and creative elements. The version of ocotillo that I visited in my local botanical gardens was not nearly as leaf-covered or flowering, but a little research and creativity can help make a great impromptu botanical sketchbook page even in January when most plants are gray and leafless. I like the visual format of the “top nine” posts that a lot of people do on Instagram around the New Year, so I went and illustrated my own version; not of my most-liked Instagram posts, but just of some really special things that happened in 2018.